CBS has replaced the 72 year old Guiding Light with a new version of Let's Make a Deal. I could rant about this for quite awhile. 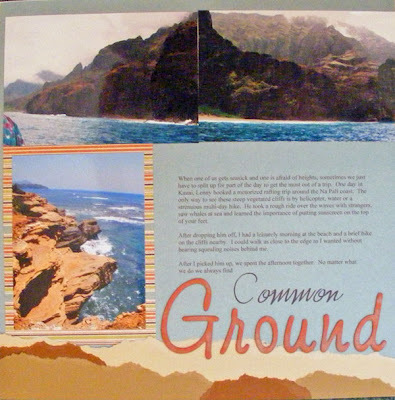 Instead, I'm going to borrow their phrase to describe what I did to correct a weakness I have in scrapbooking travel pages. Hint: there is a door #2 coming up. 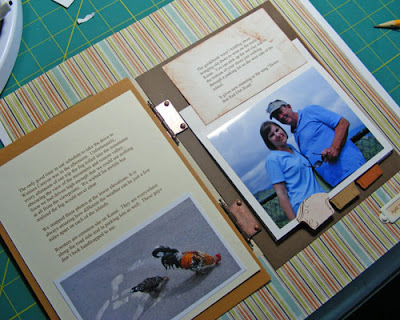 Like every good scrapbooker has been taught, I do not use ALL my photos. I do use LOTS of my photos. 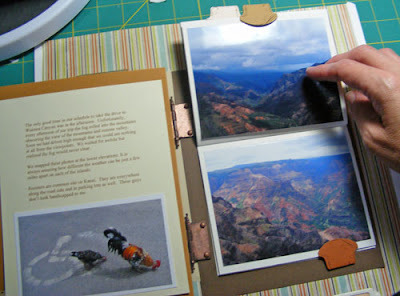 When we go on a trip - particularly a big trip we have saved and planned for - I want to capture all of it in our scrapbooks. This however either takes many pages or makes for very crowded pages. I've used hinges and various types of hidden photo tricks before. Usually though it is when I run out of room that I put one of these in place. This time, I planned ahead. 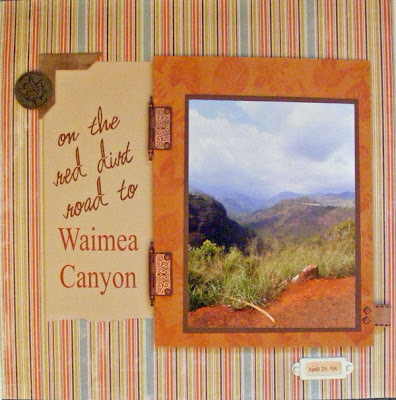 Waimea Canyon in Kauai was beautiful yet I didn't want to devote more than 1 page to it near the end of this album. Also I really wanted to showcase this one terrific photo. So I mounted the photo on a large piece of cardstock I stamped with lots of leaf images and distressed, then added these cool hinges I bought a couple of years ago from our one local scrapbooking store. Behind the photo? Door #2 - Lots more photos layered with tabs. Another virtue of these pages is all the scrap cardstock I used up. Now I won't feel quite so guilty when my next paper shopping urge hits. Metal tag: Vanilla Hodgepodge Hardware by SU!